If the chief end of man is to glorify God and enjoy Him forever, how do we accomplish this? How do we know how to glorify God, and how can we learn to enjoy Him? It seems these days the key to being a best-selling author is to have had some type of awesome encounter with God. The latest fad in religious bookstores is books written by people who claimed to have been to heaven, or that they simply put their pen to paper and God did the writing. Others say God appeared to them with some new message that God chose them to share. Are these the ways God has chosen to reveal Himself? It seems very unlikely. Do you want to know what heaven is like? God already gave John a vision of it, which was recorded for us in the New Testament book of Revelation. Do you want to know what message God has for you? All 66 books of the Bible are His message to you. It is true that we can learn about God through His created world, as Psalm 19:1 says, “the heavens declare the glory of God, and the [sky] shows His handiwork.” We can look around and know there must have been a Creator who is powerful, and therefore God. But when it comes to knowing how to live—how to glorify God—the Bible is the only sufficient source of information. Although God used humans as His instrument, He is the author (2 Timothy 3:16/2 Peter 1:19-21). Every word contained in the Bible is true. I don’t have to prove it; if anyone doubts, it is up to them to disprove it. And after 2,000 years of trying, so far no one has. As believers, we need to take Scripture for what it is, and be careful that we do not add to or take away from it, even if that means rejecting the teachings of a pastor that preaches something extra biblical (Revelation 22:18-19/Galatians 1:8-9). The best way to learn the Bible is to read it. Make sure you pray first for the Holy Spirit to teach you as you read and to lead you into truth (John 16:13). Answer: The chief end of man is to glorify God, and to enjoy Him forever. The Declaration of Independence states that we have been endowed by our Creator with certain unalienable rights, which include life, liberty, and the pursuit of happiness. This has led many Americans to, without realizing it, believe their chief end is to pursue happiness. 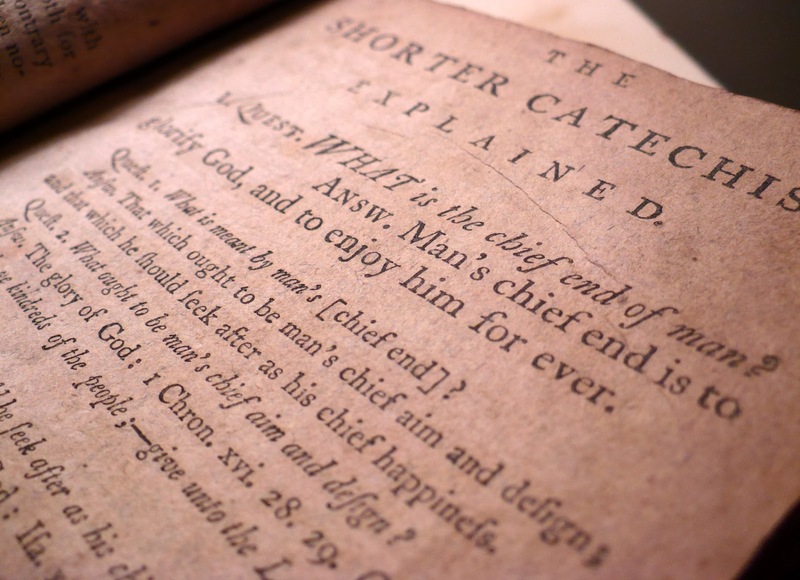 The Westminster Shorter Catechism begins by saying the chief end of man is to glorify God and to enjoy Him forever. That might sound confusing, but if we understand that concept then we will understand how to truly live. The chief end of man—or the reason we exist—is to glorify God. Revelation 4:11 says all things were created for God’s pleasure, and that includes the human race. God chose to make mankind to please Himself; therefore, we exist to please and glorify God. A recent poll showed that being a lumberjack is the worst job in America, but whether you are a lumberjack or a lawyer, do your work for the glory of God. It is not the type of work we do, but the way we do it that pleases God. Whatever we find ourselves doing, we please God when we give it our best. How much truer is this concept when it applies to our spiritual lives? When we pray, read our Bibles, and seek God with our whole hearts, He is pleased. God enjoys us when we live our lives for Him, and we can enjoy Him forever when we reflect on what He has done for us. With God as our adopted Father we can enjoy His presence both on earth and in heaven. Question: Don't we have to be good enough for God to love us? Answer: No, God loves us in spite of the wrong we do. One of the saddest misunderstandings in human history is the false belief that God’s love is based on how well we perform. As we continue to think about our adoption by the Father, think about each Christmas or birthday you had growing up. Did you earn the gift under the tree, or did they come regardless of your behavior? While I have heard many jokes about receiving a lump of coal in a stocking, I have never heard of a person who woke up on December 25th to a carbon Christmas. Gifts, like love, are not earned; gifts are given by the giver simply because the giver chose to give the gift. We were dead in our sins (Ephesians 2:1/Colossians 2:13) with no hope of salvation. Jesus did not come to earth to save the best of us; as He said, it is not the well who need a doctor, but the sick (Luke 5:31). According to psychologists, the number one question adopted children ask themselves is, “How long will take for them to stop loving me?” Many of these children have been abandoned by biological parents, grandparents, and extended family, and many were mistreated when foster parents gave up on them. On average, each foster child will go through multiple homes before finally being adopted. They figure it is only a matter of time until their new family throws them back out and into the system. But God will never throw us out; His love will never end. He promises that there is no condemnation for His children (Romans 8:1); no sin will break the deal. God promised His love, demonstrated it through Jesus, and sealed us with His Spirit. This knowledge should not make you want to sin more, but less. When the orphaned child understands the magnitude of where he was brought from, he will naturally want to love, obey, and enjoy the company of the one who delivered him. We were that orphan. Do you understand what Christ has done for you? This should motivate you to give your all for Him. Question: What does it mean to be a child of God? Answer: That I belong to God who loves me. Last week’s question showed that we become children of God through adoption. Wouldn’t you say that adoptive parents do what they do out of love? Waking up with a newborn at night is difficult with your biological child; how much more love would it require doing that with one who is not your flesh and blood? The same can be said of all the trying things that children do. Children certainly are not cheap. Raising a child for 18 years costs Americans an average of $241,000. Add to that the average cost of adoption, which is another $30,000. People do not adopt on a whim; adoption is not done for luxury. Those who choose to adopt are motivated by a heart of love for the child. They commit to care for that child for the rest of her life. Try to imagine yourself in the tattered shoes of an orphan, wandering through life essentially on your own. And then one day the social worker tells you that you have been chosen—that someone is taking you home to be a loved member of their family. Being adopted by God makes us rightful heirs. Romans 8:16-17 teaches “The Spirit Himself bears witness with our spirit that we are children of God, and if children, then heirs—heirs of God and joint heirs with Christ, if indeed we suffer with Him, that we may also be glorified together.” Instead of receiving our inheritance after the Father dies, we receive it after we die. Aren’t you glad that the God of the universe chose to love you and adopt you as His own child? What should we have seen coming? One murdered thousands of people. The other quoted the Bible. 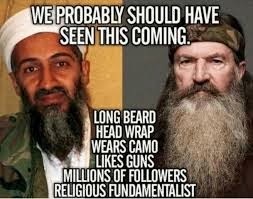 This is a typical atheistic move, comparing murdering terrorists to Christians.